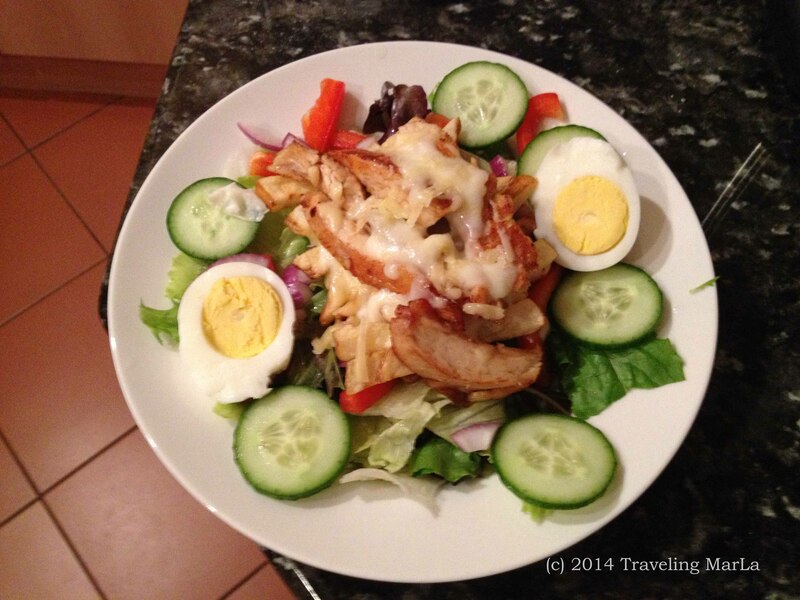 A Pittsburgh Salad in South Africa…and a Superbowl Party? First, let’s be clear that like most things Pittsburgh, our local flavors vary by suburb. The Pittsburgh Salad is no exception. But most will agree that whatever the actual salad base, it’s topped with a combination of fries, cheese and either grilled chicken or steak. This is the first time we’ve made a Pittsburgh Salad in South Africa, but we needed a practice run. Our favorite restaurant here in Pretoria is having a Superbowl party Sunday night/Monday morning (we’re 7 hours ahead of Pittsburgh) and they’re putting a Pittsburgh Salad on the menu. Even though our team isn’t playing, the managers are NFL fanatics, and Steelers fans for life! Of course. But also, Steelers world. Who makes a salad with fries on it? Pittsburgh, of course! So I was shocked to Google “Pittsburgh Salad” in preparation for today’s blog only to find that Food Network has a Pittsburgh Salad that is absolutely nothing like a traditional Pittsburgh Salad, let alone something your average Pittsburgher would consider eating. It looks like it should be sitting pretty in some pretentious overpriced restaurant, where food is more art than food. In other words, not typical Pittsburgh fare. I don’t normally leave negative reviews, but the image of Pittsburgh, particularly the traditional food, is important to me. I don’t know where they imported that recipe from, but send it back. And if you’re a Pittsburgher and agree, please don’t hesitate to click the link above and add your opinion on that recipe. I mean, just…ugh. So what is a Pittsburgh Salad…to me? Well, Kurt and I have a favorite that was from a little bar and restaurant west of Pittsburgh, and we ate there for about ten years until we moved to Washington County. I tried Pittsburgh Salads every place I ate around the ‘burgh, including a few varieties which added coleslaw (I think they riffed that from Primanti’s) but the recipe I’m sharing with you today is as close to our original favorite as we’ve been able to make here. Kurt is the fry cook. I wanted to opt for a healthier baked version, but he said “No way. Not for our first Pittsburgh Salad in South Africa you don’t!” Fair enough. I must have been thinking I was from L.A. or something. Like I said above, Pittsburghers tastes will vary by region, and so we will always have good debates about our favorite wing sauce, our favorite beer, and our favorite Pittsburgh Salad. But generally, most of us natives want a good portion of fries, cheese and meat with our veggies. Let the imports eat the food-as-art salads. 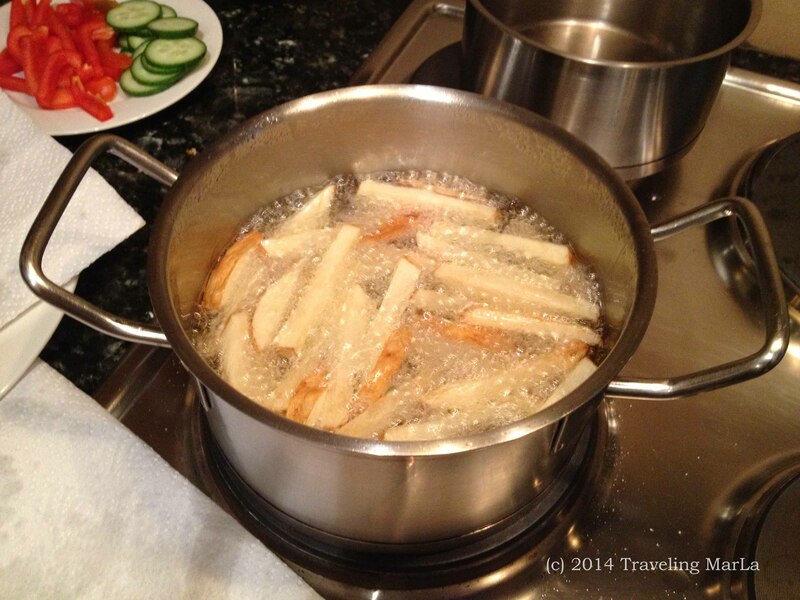 large handful of fries (“chips”) – Kurt makes these homemade in a pot of cooking oil. 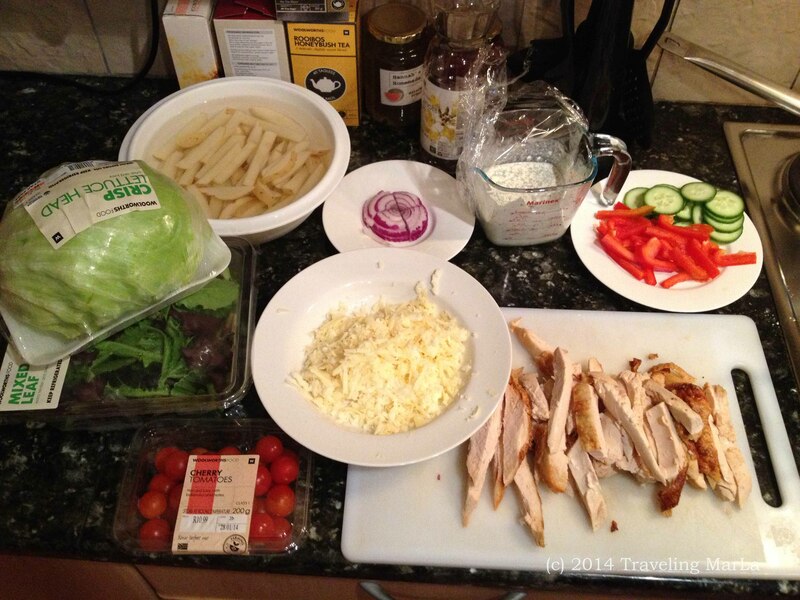 1/2 breast or fillet grilled chicken or steak cut into strips. 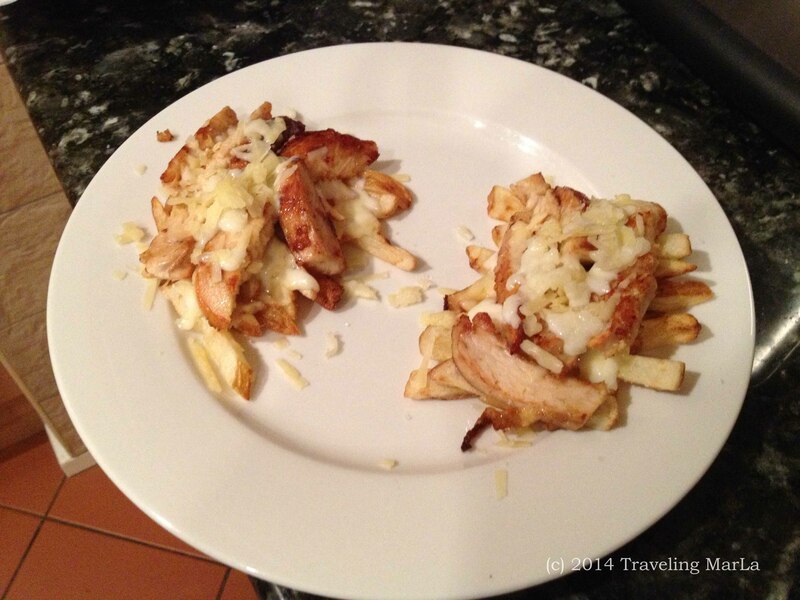 We usually season our fries and chicken with a bit of salt and a bit of spice to your taste. 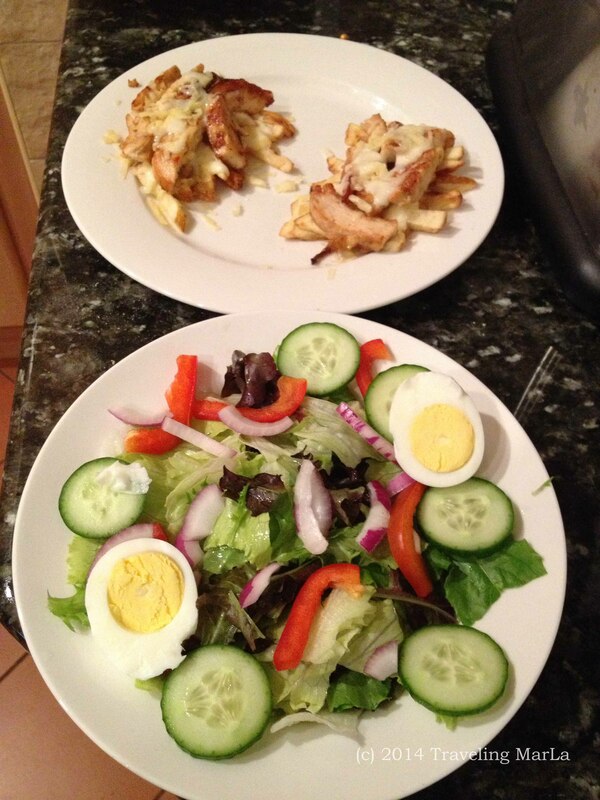 *The topping is microwaved separately to melt the cheese onto the fries and chicken and then placed on top of the salad so that the salad is cold but the topping hot. The topping is critical for a Pittsburgh salad. In the states, we purchase bottled Ranch dressing, which is quite tasty. In South Africa, where none of the expats have been able to find good Ranch, we have been bringing our dry Hidden Valley packets from home and making it here. Kurt and I love the combination of really crunchy veggies like peppers, cukes and onions combined with the soft texture of eggs, fries, chicken and cheese. Oh boy, now I’m drooling again. Western Pennsylvanians: Feel free to add your own Pittsburgh Salad recipe or variation in the comments below!! P.S. I double-dog dare you to make this salad and not crave fries (chips) on your salads in the future. Want to join us for the Superbowl party? I’ll be there in my black and gold, taking photos and writing another article for you next week. But if you want to join us, ACT FAST because they need an accurate head count for the food! Charlie, the manager at Mo-zam-bik, has been kind enough to organize a Superbowl party. He is planning to show the game on a big screen and serve food and drinks starting from 12:30am onward on Mon. morning. If you are interested please call him at 012 817-2014 or email him at charlesmeyer87@gmail.com. Love it! Ummmmm, we may be having nachos and wings btw – here in DENVER – Go Broncos! Yowza!! That food network recipie not even in same hemisphere!! I’ll be joining you guys for the superbowl party, even though only in spirit!! Enjoy! Miss youns!! YUM! SO hungry for one now! I’m writing up my monthly meal plan and grocery list right now….I know what I’ll be adding! Haha. And I TOTALLY commented on that Food Network recipe! Yikes! Not sure where they got the name for that one! Doggles: The Latest in Fashion Accessories for Humans?